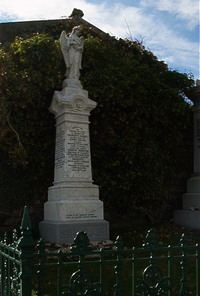 Erected by the husband and family in memory of. Charlotte Calder died 17th July 1906 aged 71. Husband Andrew Sinclair of Lappan died 24th August 1917 aged 83. Daughter Charlotte Sinclair died at Glasgow 14th April 1910 aged 37 wife of James McDonald of Dunbeath. David Sinclair died 26th March 1951 aged 91. Wife Catherine Sutherland died 7th April 1943 aged 85. Son David A D Sinclair died 24th October 1981 aged 89. Daughter Catherine Sutherland Sinclair born 25th November 1904 died 16th November 1996 aged 91. Father in thy gracious keeping, leave thee now thy servant sleeping.